Do you have a teenager in your life? I ask this question a lot these days, because a young person’s developmental experience during the dozen or so years called adolescence has become my passionate interest. I feel fortunate that my life has brought me to my current situation. I look back on my own adolescence, and there were times when my life could have gone very wrong. But it didn’t. I was lucky. What could go wrong? Well, a lot is going on in a teenager’s life. For starters, hormones are triggering their young bodies to grow into mature adult bodies. These changes include sexual maturation and the awakening of feelings of sexual desire. This can lead to sexual exploration, which can lead to unwanted pregnancy and sexually transmitted diseases. With so many changes, they’re wondering who they are and what they want to be, searching for their unique identity and values. So they’re concerned about their appearance and keenly sensitive to peer pressure, which can lead to bad influences, as well as experimenting with alcohol, tobacco and drugs. The teen journey can be a perilous one. But the more important changes are happening in their brains. As I’ve explained in other posts, at the onset of puberty a “second wave” of brain development causes a mass blossoming of dendrites in their prefrontal cortex. Throughout adolescence, the window of opportunity to “use or lose” these brain cell connections will last at least ten years. Then the window will close. This part of the brain has to do with critical thinking, evaluation, judgment, decision making, planning, imagining, logic, and intuition. Important! So if they’ve exercised these functions a lot, the brain cells involved will survive. The brain cells that aren’t used will wither away. What’s left will be a rich foundation for critical thinking – or a minimal one – for the rest of the young person’s life. The irony is that while they should be exercising these important functions, at first it’s overwhelmingly difficult. The mass blossoming creates a chaos of their prefrontal cortex. This part of their brain will be “under construction,” so to speak. Therefore much of their decision making will be impulsive, not based on careful thinking about cause and effect and consequences. We’re talking dramatic mood swings, confusion, anger and depression. Emotions will rule most of their actions. You can expect disorganization and a lack of discipline and self-management. Even though they’re in school to prepare them for their future adult life, their brains ill-equipped to plan for the future. Also, if they do experiment with drugs or alcohol during this sensitive time, the development of their prefrontal cortex could be disabled and they could suffer permanent cognitive impairment. All this is normal, but as I said – the teen journey a perilous time of life, with enormous consequences. Kids don’t realize that they’re on this journey. Neither do their parents. It has become a passion for me to explain it and to pass along the guidance of experts. 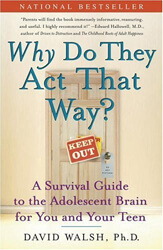 One of my favorite experts about the teen journey is David Walsh, Ph.D., author of Why Do They Act That Way? His explanations of what’s going on in a teenager’s brain are correct and easy to understand. The stories he tells to illustrate what’s happening are engaging. And his advice is on target. Dr. Walsh focuses on a half a dozen major red flags that adults need to be conscious of, and he makes many recommendations. If you have a teen in your life – as a parent, teacher, coach, counselor, mentor – I strongly recommend that you read this book. Or better yet, read it before your child reaches puberty. Because it’s easier to build strong bridges than to repair damaged ones. 1. LOVE. This is the foundation. If a kid knows his parents love him, that is the lifeline he or she can hang on to during the teen years. 2. COMMUNICATION. All the help you want to give a young person depends on good communication skills. Communication skills are like golf and chess. No matter how good you get at it, there’s more to learn. The smartest thing an adult can do is to begin a life-long journey of improving communication skills. 3. SUPPORT. To pursue their passionate interest or get involved in an activity that will help them grow stronger, they may need help – information, transportation, equipment, etc. 4. GUIDANCE. Kids need coaching, boundaries and direction. But in their desire to explore their identity and independence – which are good things – they often resist adult guidance. But they must have the right kind of coaching to exercise their prefrontal cortex, to use it or lose it. Everything depends on this. But a well-intentioned adult will find this almost impossible without a foundation of love and good communication skills. Easy to understand, infinitely harder to do. Dr. Walsh’s classic book will help.